Yangon in Myanmar, featuring the Shwedagon Pagoda. Better known as Burma, Myanmar was renamed in 1989 by the ruling military junta at the time, as was many of the country’s cities and towns including Rangoon, which is now Yangon. But just to confuse you a little more, the adjective is still ‘Burmese’; as in Burmese people, Burmese language and Burmese food. 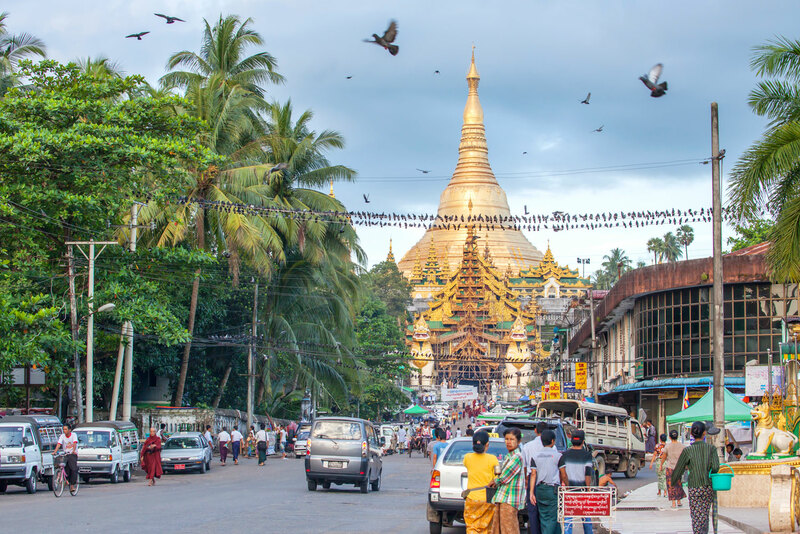 Tourism is a relatively new industry in Myanmar, which means getting around, communication and understanding the often-changing airline regulations can sometimes be a struggle for independent travellers. Arranging a tour guide to help translate and provide local insight is one of the best travel decisions you can make…after deciding to visit Myanmar, of course. We highly recommend Exo Travel Tours. Being in the tropics, Myanmar can be hot and steamy at the best of times so long, lightweight clothing is ideal to help protect you from the sun and pesky mosquitoes. And considering over 85 percent of the population is Buddhist, it’s in good taste to cover up and ensure your shoulders and knees are covered. This is essential when visiting pagodas and monasteries. You’ll need a tourist visa to enter Myanmar, but the new E-Visa online system means it’s easier than ever. It costs $50, is valid for 28 days in the country and best of all, you’ll likely find out if your application has been approved within a matter of hours. Keep in mind that in order for your visa to be accepted, you must be arriving at Yangon, Nay Pyi Taw or Mandalay international airports. Don’t forget to carry a printout of your acceptance letter when entering and leaving Myanmar. Click here to apply for your visa. Internet access is still in its development stages in Myanmar and connections can be quite slow, so do be patient when uploading your latest brag-shots to Instagram. Internet is also regulated here so access to some websites can be filtered or off-limits entirely. Having said that, more and more hotels and cafes are providing wi-fi, particularly in more developed areas such as Yangon, Nay Pyi Taw, Bagan and Inle Lake. Travellers don’t come to Myanmar to booze and party – there is so much more to see and do than that. As a result, there’s not much in the way of western-style entertainment outside of hotels (though Yangon does have a few bars). If you’re looking for a taste of the local culture in the evenings, head to tea shop, beer hall or night market. Myanmar is well known for its precious stones, especially rubies and jade, however there are many knock-offs around. If you do decide to purchase a gem of sorts, make sure you ask for an official receipt or certificate, which is issued by government-licensed dealers. You’ll need to show your certificate when exiting the country since the export of gems and stones without government-issued documentation is illegal. The national language here is Burmese, of which there are over 80 different dialects spoken. You’ll find in cities that many people speak some English but as in most foreign-speaking destinations, it’s always appreciated when travellers at least try to use local phrases where appropriate. The local currency is kyat – pronounced ‘chat’ – which you can roughly divide by 1000 to work out its value in Australian dollars. While the US Dollar is accepted in some places, notes need to be in pristine condition. Therefore it’s better to carry kyat with you instead, which is best withdrawn from an ATM at the airport upon arrival. Credit cards can be used in some places but always have a back-up plan since intermittent internet can mean this service is often unavailable. Finally, be aware that Traveller’s Cheques cannot currently be used throughout Myanmar. Keeping in mind this is a country where the average income is less than $350, tipping is always appreciated but not compulsory. We suggest tipping for good service at restaurants, drivers, tour guides and hotel porters. Hi Jessie, Glad you enjoyed. Tell us all about the trip. Enjoy!